Do you need a professional to revive your appliance? Call us today to schedule an appointment for one of our trained technicians to repair your appliance and get it back in working order. We repair all major brands, including: Whirlpool, Sears, Kenmore, Maytag, GE, Amana, Kitchenaid, and more! Since 1976, Thomas Appliance Service has been providing friendly service, expert workmanship, and competitive prices in Santa Clara County,including Gilroy and Morgan Hill. 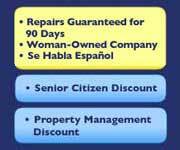 We offer senior citizen and property management discounts. We have made a commitment to provide fast, reliable and dependable service to our customers, while providing some of the most reasonable rates in the industry. Our website is here is answer some of your questions. Your can schedule an appointment or just give us a call. We want you to be one of our many satisfied customers.